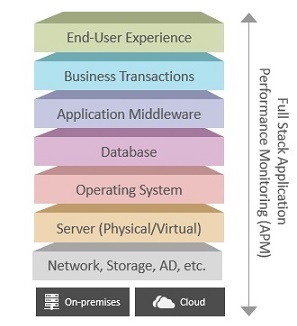 Most application performance monitoring (APM) tools offer user experience monitoring and transaction tracing capabilities. But, when there is infrastructure slowness affecting the application, these APM tools cannot always pinpoint the root cause of problems. This is where unified infrastructure monitoring comes in. Visibility into the availability, performance and usage of every tier of the infrastructure – virtualization, cloud, storage, networking, Active Directory, etc. Correlation of metrics across the different tiers, to be able to determine the exact cause of slowness. Database-specific problems like index fragmentation, redo log contention, etc. Without sufficient visibility into the performance of supporting infrastructure tiers, it is hard to narrow down the root cause of a slow business transaction. Ultimately, the application has to work in concert with various infrastructure components that it relies on, as a problem in any of the dependent tiers can ripple and affect application performance. Organizations should consider using application performance monitoring tools that provide converged performance visibility of applications and the infrastructure. Without forcing you to toggle between separate management consoles for each part of the infrastructure, your APM tool should provide correlated visibility across user experience, business transactions, applications, databases, and the supporting infrastructure tiers such as network, storage, virtualization, cloud, containers, etc. This is true "full-stack" application performance monitoring.